Madrid Tapas will set you straight about this frequently heard of yet often misunderstood aspect of Madrid and indeed Spanish culture! Done right you can find that a little of everything can be more fufilling than a meal and cheaper on the wallet at the same time! Here Madrid Guide Spain offers a quick guide as to what foods to expect and the best places to try them. After all if there is one part of Spanish culture you must try this is it! We´ve even made it easier with our listing of over 100 top Madrid Tapas bars and restaurants! If you snack with a drink you will drink more and eat later! Not so different from the fast food chains putting extra salt on the fries to ensure you order a large drink! 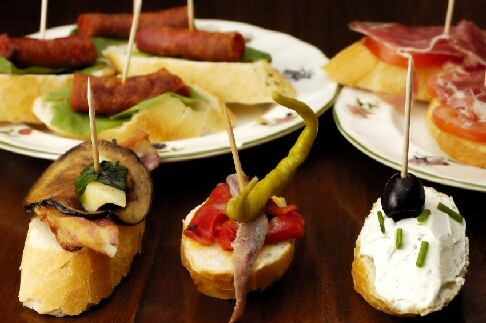 Tapas are a small snack given free when ordering a drink in a bar. Sometimes restaurants will also offer a free Tapa but this is the exception rather than the rule! Due to its sheer size and the migration to it of people from all over Spain ,Madrid tapas is some of the best available. In terms of both quality and variety. Of course you have to expect to pay Madrid prices for it! At any bar the ordering of a round of drinks, except coffee, should see you presented with a small tapa. Depending on the bar and time of day this can be anything from olives (aceitunas) to a small elaborate sandwich. It can be either hot or cold and, as always, some bars provide more than others. If you stay in one bar and it is of reasonable quality you should find the tapas change and get better the longer you stay there. A simple snack made with nothing more than eggs and potatoe this will quickly take away any hunger pangs. Served in a multitude of ways; Slices, squares, on bread, in bread, with or without ham / cheese / asparagus / onion the combinations are almost endless! This is a more elaborate tapa with fried eggs, bacon and potatoes mixed together. Of course if the is some Jamon or an onion going spare it inevitably finds its way into the mix! Heres where things get a little complicated. Salchicha means sausage however sausages in Spain come in many different forms. There is the dried dark red spicy (or not) chorizo, the white salchichon, the blood sausage morcilla or small cocktail sausages that are served with bacon wrapped around them. Typically a thin slice of baguette will have thick or thin slices of the sausage on top of it secured with a toothpick. Outside of the city centre your best bet is Goya and Barrio Salamanca. Check out our Madrid tapas guide, over 100 tapas bars and restaurants. Madrid tapas worked up an appetite? Try our top ten Spanish foods!